That was what I was there to see, and I dare say most of the rest of the audience, too – Lisa Wolpe doing her internationally acclaimed cross-gender performance of Shakespeare. First impression: Her Romeo seemed a bit, what, contrived? Mannered. No, Constructed. That’s the word. I immediate thought that he was a bit too artificially created as he pondered the light breaking through the window and my heart sank just a little… and then Wolpe gracefully slipped into Juliet. Charming, but also – to exactly the same degree, although in opposite technical ways – constructed. It took a second for me to realize that that, of course, was her point. Adolescent self-invention is a series of poses, assumed (and often quickly discarded) identities, and painful attempts at self-definition. Watching Wolpe alternate Romeo and Juliet foregrounded the awkward self-consciousness of both young lovers. Wolpe remembers exactly what it was like to try to create oneself as a teenager, and brings that knowledge to the performances. We watched her characters struggle to invent appropriate outward expressions of their inner lives – and while we saw how arbitrary the role models for doing so really are – the scene was about so much more than that. Wolpe delivered about the most nakedly honest representation of adolescent love I’ve ever seen. Best moment: Juliet’s “What’s Montague? It is nor hand, nor foot, nor face, nor (suddenly blushing and mumbling) any-other-part-belonging-to-a-man.” Genius. I was looking forward to seeing how this foregrounding of gender role construction was to develop over the evening, but in truth, once established it did not have to be repeated, and wasn’t. Instead the balcony scene soon segued into new – unexpected – material. 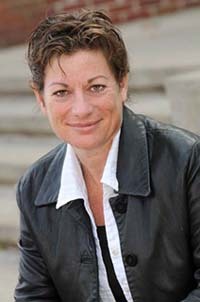 Wolpe shared the tragic story of her family – losing both parents at a young age – both apparently suicides. Her father, a traumatized WWII veteran, died when she was a toddler, her mother a decade later, but not until after entering into a disastrous, abusive second marriage. When Wolpe transitioned back to Shakespeare, as Hamlet, she had already established that her connection point to the role was a shared longing for a lost father – to which, it turns out, gender is fairly irrelevant. Her Hamlet is gendered male, but it hardly registered, since it is the searing intensity of her identification with Hamlet’s loss that powered the performance forward. It was an astonishing realization of the emotional and psychological complexity of the role, as fulfilled as any I have ever seen, but not about Hamlet’s self-constructed gender. Her alternating of Shakespearean performances with personal revelations continued throughout the evening, as did her alternating male and female characters. Playing the falsely accused queen, Hermione, in the trial scene from The Winter’s Tale, the approach seemed unlike any performance of the role I have ever seen. This Hermione was not the dignified and articulate noblewoman, certain of her innocence, we usually see. This Hermione was disempowered, defeated and disintegrating right before our eyes. It was a shockingly incisive portrait of a domestic abuse victim. The only surprise in the revelation that it was based on her mother was the deftness and concision with which it was handled – a single sentence inserted as an aside into the middle of the monologue itself. It did not take long to become clear how passionately Wolpe cares about empowering women’s voices (especially those that are elsewhere suppressed or ignored) on stage. The fact that she refuses to be limited to channeling those strictly through female characters is telling, but so if the fact that she does not channel them strictly through male characters, either. Gender is a tool, not a trick, in her creative arsenal. Her performances have a lot to say about the range of human experience, and the manner in which gender can provide agency, but the striking power of her characterizations derives from the fact that the container is never more interesting the contents. I rather frequently lost track of the fact that Wolpe was jumping back and forth across gender boundaries, but I never, for a second, stopped realizing that I was watching a great artist at work. She has probably more experience played cross-gendered Shakespeare than any actor in America, so perhaps it is that she makes it look so easy and unremarkable that allows us to forget that it is, in fact, technically difficult and still (unfortunately) controversial. She never takes the easy “non-traditional casting” path, however, of re-gendering the character. No Prosperas, Queen Lears, or Macbethanys for her. Part of her exploration of acting and characterization is delving into the gender roles, assuming the agency that both male actors and characters are more freely granted, not just claiming the lines and scenes to ease the under-representation of women in theatre. As the evening progressed her performances cherry-picked some of the very best of the canon, included Henry V and, fascinatingly, Shylock. The reason for the latter choice became clear as her family story began to focus more and more upon recovering her father’s astounding history – the only member of a German Jewish family to survive the holocaust, decorated war hero (fighting with a Canadian regiment), self-appointed avenger executing hundreds of captured German soldiers, and finally haunted PTSD victim taking his own life. We drifted further and further from seeking perspective on the performance of gender on stage and in life, and began directly to explore the tragic consequences of inhumanity. A Work-in-Progess, but What Work! 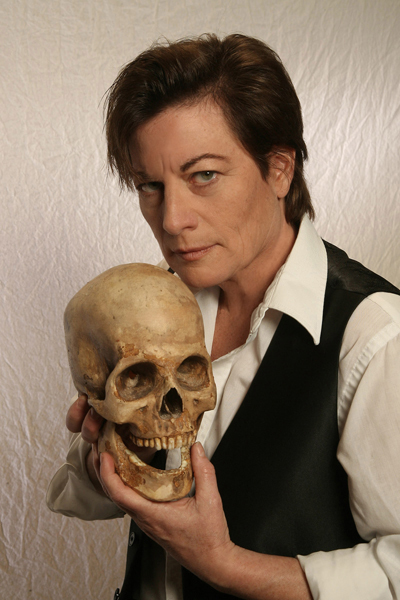 Shakespeare and the Alchemy of Gender is still a work in progress, and as a solo show it has some dramaturgical difficulties, not the least of which is that the longer into the evening we get the less it is focused on its titular subjects. Wolpe is not yet a world-class author, which is only apparent because she is a world-class actor. The most polished parts of the evening are the scenes and monologues from plays that she has starred in and performed in their entirety. She is still crafting the personal narrative that introduces and surrounds them. But as a showcase for an actor of genuine brilliance, for an artist insightfully deconstructing gender roles, and for an activist empowering women’s voices, it is a great vehicle. Seeing Wolpe work is watching alchemy in action – that particular magic by which an actor transforms herself into someone totally different while simultaneously revealing her deepest self. She is a living treasure. The show is now touring. See it if you can. You are currently reading Getting Cross-Gender Performance Right: Lisa Wolpe and Shakespeare at Shakespeare's Tribe.